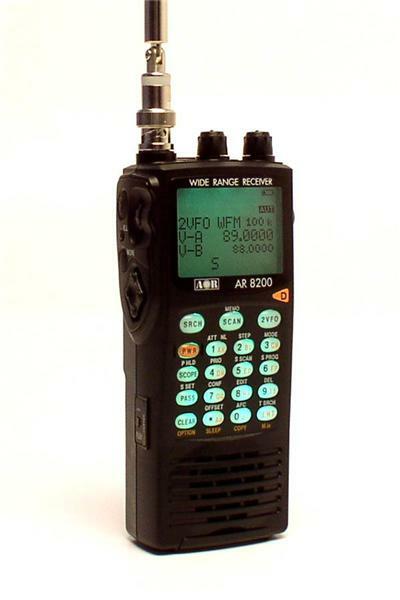 100kHz - 3000MHz (100-530kHz performance not guaranteed) * WFM, NFM, SFM, WAM, AM, NAM, USB, LSB, CW * Tuning steps programmable in multiples of 50Hz * 8.33kHz airband step supported * Step adjust, frequency offset, AFC * 1,000 memories (20 banks) * 50 Select scan channels * Scan/Search rate max 37 steps per second * 40 Search banks * True carrier re-insertion in SSB modes * RF preselection of mid VHF bands * Detachable MW bar antenna * Noise limiter & attenuator * Versatile band scope with save trace facility * Twin frequency readout with bar signal meter * Computer socket fitted for control, clone & record * 4 x AA cells (1500mAH) or 12V DC supply * Consumption 190mA (nominal) 145mA (standby) 25mA power save * Size 61 x 143 x 39mm * Weight 340g (including Ni-Cads & Aerial) The AR-8200 Mark 3 developed on the successful AR-8200 Series-2 is the new all-mode receiver. It now has extended receive frequency coverage to 3GHz, the illumination has been further enhanced, and high capacity Nickel Metal Hydride batteries supplied. Performance has also been improved for best sensitivity and strong signal handling over the extremely wide coverage of 530kHz to 3000MHz. A telescopic whip on a swivel base, and a MW bar aerial is provided as standard. The AR8200 Mk3 is supplied with 4 xAA 1500mAh Ni-MH batteries reflecting the improvements in modern technology. The all important 8.33kHz airband channel step is correctly implemented (eight-and-one-third, 33, 66, 00). Steps can be programmed on any mode in multiples of 50Hz. Extensive step-adjust and frequency off-set facilities are also provided (as per AR-5000) to ensure tracking of the most obscure band plans. The RF front-end is preselected around VHF to ensure the highest levels of adjacent channel rejection. The SW bands are converted to an IF of 45MHz to remove unwanted products. A side keypad on a rocker provides four arrow keys resulting in more natural and intuitive navigation through the on-screen menus. A larger than average back lit LCD with contrast control provides operational data wioth the ability to add 12 character text comments to each memory channel, memory bank and search bank.A multi-function band-scope provides adjustable span width from 10MHz to 100kHz. Computer control is available via a side mounted connector and optional lead, an extensive RS232 command list is supported. This connector also supports cloning of data between two AR8200 Mk3, along with tape and detector output, mute and AGC. FREE PC software is available as a download from the AOR web sites. A series of optional internal slot cards which fit into the AR8200 Mk3 base and extend the capabilities even further. Memory slot card, increases storage to 4,000 memories, 160 search banks. CTCSS slot card with added squelch and search facilities. Record chip slot card which records up to 20 seconds of audio. A tone eliminator slot card for use on the shortwave bands, and a voice inverter slot card which makes intelligible some of the scrambled transmissions on the bands. NOW AVAILABLE.